Sustainable and cost effective operation of the entire power plant onboard. Save fuel and money with a PMS system from Marine Control Services. MCS delivers Power Management Systems (PMS) for control of switchboard and generators to the marine industry. With enhanced functions and advanced technology, the safety of the vessels is the focus of the PMS. MCS Power Management is delivered in different set-ups. Standalone - Used mainly for retrofits – No separate IAS involved. 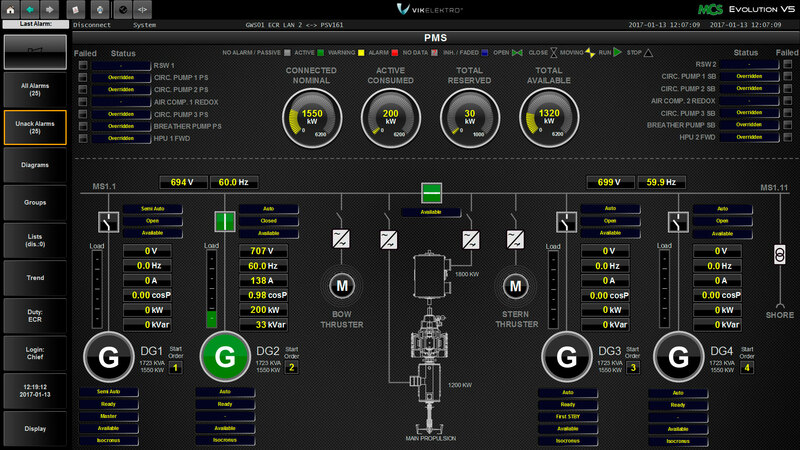 Fully integrated PMS in Evolution V5, with safety units in the SWBD. Our knowledge in engineering, installation and commissioning will give your vessel the optimal solution. With enhanced functions and advanced technology, the safety of the vessels is the focus of the PMS. The modular hardware and flexible software solution will guarantee sustainable and cost effective operation of the entire power plant for control of Diesel Generators and Gas Generators, Shaft Generators with PTI & PT and Emergency Generator, Bus Tie breaker and Shore Connection. 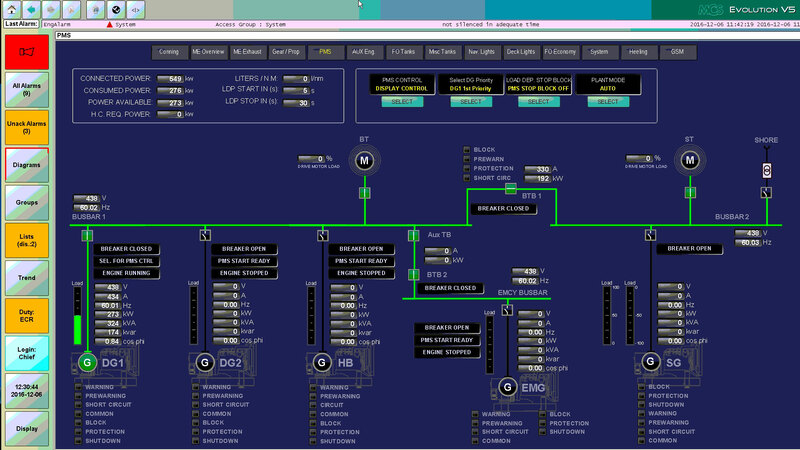 The PMS system may be delivered as a fully integrated part of the MCS Evolution V5 IAS or as an independent system. This makes the MCS PMS ideal for both new buildings and retrofits. With MCS extensive experience, we provide turnkey solutions including design, engineering, installation and commissioning. MCS Remote Assistance enables fast and cost effective support by our service team, wherever the vessels are located on short notice.